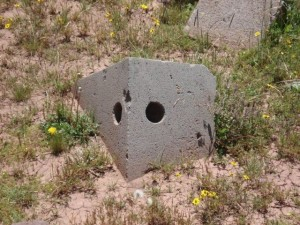 Who Built Puma Punku, Why & What Was It For? 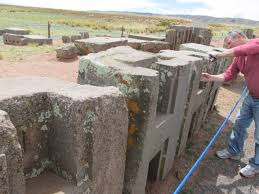 Who built Puma Punku, how and why? The precision of the masonry work is undeniable. Skilled stone masons today shake their heads at the evident expertise. The Tiwanaku built it. It is theorized that it's function was as a ritual and spiritual gathering site. There are skilled masons on this very forum, and I'm sure they respect the expertise but don't find it impossible. Because that's where you trying to go with this, right? ...and maybe don't use such painfully obvious clickbait to start a thread. Thank you for editing out the race-baiting remark. Well, I mean, that's where this set-up goes, though. We've all sit through this a dozen or more times. Something is "impossible" because anybody with brown skin is incapable of working stone/inventing writing/domesticating plants and animals, and we need to create some mythic white people/aliens to account for the anomaly. Nobody ever goes around claiming the Romans couldn't build ****. Saying that idea is inherently racist (not to mention just plain wrong) isn't "race-baiting" and people who share it oughtn't get to dodge the consequences of repeating racist claptrap. Nobody ever goes around claiming the Romans couldn't build ****. I've heard it claimed the Romans couldn't have built the base platform at Baalbek or the base platform at Temple Mount. To be honest, any association between great stoneworks and skin color seems to be your very own theory. We had a fabulous topic done on the ways Egyptians cut stone and it really taught me a lot. I am not sure if we have enough data known on the methods the Bolivians may have used that far back to do it. Probably similar, but, I don't know this. Which is an odd thing to hear, as those object are still inside the Roman-era quarry they were hacked out of. And you clearly haven't hung around much here, if you think racist alt-history is my creation. I'm sure other regulars will be happy to back me on this. Jayle has a very valid point. It's a problem that goes back over 100 years: indigenous people weren't capable of the great works of engineering found within their realm, so it must've been lighter-skinned people from elsewhere. We can extend that to much broader terms today: ancient man in general couldn't have done it so it's some lost civilization with advanced tech, or aliens, or other such foolishness. What this boils down to in nearly every case, is the fringe proponent advancing such a theme is quick to latch onto the absurd but extremely hesitant to put real research into it. There was no instance of "racist alt-history" in the OP, so it's your creation here. Also, are you suggesting the Romans were the first people smart enough to locate a suitable quarry? Earlier inhabitants never quarried where the Romans did? It's a problem that goes back over 100 years: indigenous people weren't capable of the great works of engineering found within their realm, so it must've been lighter-skinned people from elsewhere. Yes. Which is why I'm astonished Jaylemurph would have us believe all rock quarries in the Levant of any note are strictly those established by the lighter-skinned, yet apparently very smart, Romans. How did they build it? Andesite. Very hard stone. Machined to precision. These cuts were not done by hand. Not then by men with only primitive tools. To do such work by hand using other stones to hew would've taken a commitment of centuries by the most skilled artisans ever seen on the planet. I am most interested in the "how" part of the question. "Some of the stones are in an unfinished state, showing some of the techniques used to shape them. They were initially pounded by stone hammers, which can still be found in numbers on local andesite quarries, creating depressions, and then slowly ground and polished with flat stones and sand." Protzen, Jean-Pierre; Stella Nair, 1997, Who Taught the Inca Stonemasons Their Skills? A Comparison of Tiahuanaco and Inca Cut-Stone Masonry: The Journal of the Society of Architectural Historians. vol. 56, no. 2, pp. 146-167. I don't think the site is as mysterious as it is sometimes proposed to be. It is a testament to the knowledge of the stonemasons and the organization of the work force. One dude from 1997 spinning the tale that these were hand made cuts is a but naive. The precision small holes are the most impressive as to "how"? How? Did they have diamond tipped drills? If so, have any been found? Remnants of them? To answer your questions to me, I personally don't know "how". I'm not an archaeologist by any stretch. However, I don't believe that the construction methods of the site are beyond the capabilities of the people who lived there during that time period. Do you have any publications that state the holes were definitively drilled with diamond-tipped drills? Do you have any published material that supports your contrasting opinion? If not, then I wouldn't discredit someone who took the time to conduct the research and go through the hassle to get published. It's been proven by modern people that given enough time and dedication, stones like these can be worked with relatively primitive tools. They probably had some clever techniques that have been lost to time, but they were obviously very organized, skilled, and dedicated. It's not hard to believe local ancient people did this on their own, once you understand what it actually takes to do it. OK can you please direct me to a youtube tutorial on drilling tiny precision holes in andesite stone with the use of any type of hand tool. Also, did they find any signs of framing squares or other measuring devices to insure the accuracy of absolute laser-surface perfection in 90 degree angles on the stones hewn by hand? The fact is, the Romans certainly could have built the foundation of Baalbek. They left behind books about how to build with colossal stone, and it's been demonstrated that known Roman capstans utilized in gangs could have easily placed the largest stones in the foundation, and Roman cranes could have lifted the large stone pieces of the columns and the roof. The site is unquestionably Roman which was shown via excavations. Not only that, but there are other extant unquestionably Roman constructions that utilize stones almost as large as the 3 largest at Baalbek. 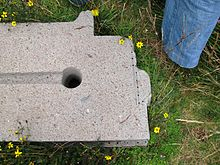 OK can you please direct me to a youtube tutorial on drilling tiny precision holes in andesite stone with the use of any type of hand tool. Also, did they find any signs of framing squares or other measuring devices to insure the accuracy of absolute perfection son the stones hewn by hand? It is you that is unconvinced. Can you not use Google yourself? The intricate carving on the H-stones shows evidence of carving with chisels. That's in the above-linked paper from Protzen. The holes you're astonished about can be drilled out with the same metal. Contrary to what you would prefer, andesite can be drilled with sand abrasives, just like granite (and diorite - which is similar to andesite) in Ancient Egypt was. If you'd look, you'd no doubt come across a vid of David Hatcher Childress holding a square against the corner of an H-block and exclaiming the perfection of the squareness of the corner, while the square itself shows the corner to be quite out of square. Did they find any framing squares or other tools at the site? How do you propose some of the multi-ton blocks were moved intact from the quarry many miles away in a zone above the tree line? Food supply for workers? Stuff like that. I'm interested in your postulations. If we just researched google, there would be no conversation here. A quick search on your part, or merely reading Protzen's paper, would have told you that there are still scratches on single sides of some of the stones that indicate they were dragged to the site. If you'll look, you'll see that most of the stones aren't very large. Regarding food, the area is rife with evidence of a VERY extensive and impressive agricultural technology. That is not what jaylemurph said; you appear to be trying to put words in his mouth. He was talking only about Baalbek. This is a very ancient site, but the quarry and construction ruins one sees there today do in fact date to the Roman period. And that's all jayle was saying. The fact is, the Romans certainly could have built the foundation of Baalbek. Yes, the Romans may have done it...but they were hardly the first to have quarried there. And the Romans didn't show a particular fondness for using 900-ton stones in any of their other works. It's also interesting these basement stones are among the oldest pieces of the construction. So, you can see that to claim the quarry there is "a Roman one" is to make a fallacious claim...or worse. As for the stones at Puma Punku, I've never heard anyone speculate that the stone masons there were any certain shade or color at all. Aliens or otherwise.